Please come join us at an upcoming meeting. New participants are always warmly welcomed. 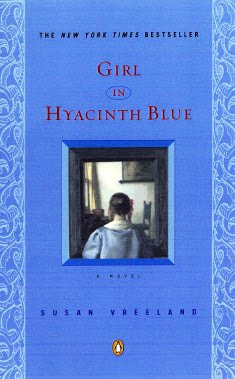 April 9, 7:30 pm Book Club will meet to discuss Girl in Hyacinth Blue by Susan Vreeland. May 21, 7:30 pm Book Club will meet to discuss Beartown by Fredrik Bachman. We are still looking for host locations for the April, May and June meetings. If you are interested, please let us know. Members are reminded that Book Club has its own Facebook page where you can stay up-to-date with current happenings. Any questions? Reach us through Facebook or at the emails listed below. This luminous story begins in the present day, when a professor invites a colleague to his home to see a painting that he has kept secret for decades. The professor swears it is a Vermeer--but why has he hidden this important work for so long? The reasons unfold in a series of events that trace the ownership of the painting back to World War II and Amsterdam, and still further back to the moment of the work's inspiration. As the painting moves through each owner's hands, what was long hidden quietly surfaces, illuminating poignant moments in multiple lives. Susan Vreeland's characters remind us, through their love of this mysterious painting, how beauty transforms and why we reach for it, what lasts and what in our lives is singular and unforgettable.